They STILL haven’t done anything?! Let’s hope that continues then! This country just does not make sense. No wonder they are in an economic death-spiral! Anything to do with communication is prone to fail here, if I mention Poste Italia and Telecom Italia in the same sentence I get an overwhelming urge to breakdown and cry, or at least go find a bottle of grappa. I can tell it ain’t going well on the communication front… but how are the kittehs? We have kept 2 kittens. Ruthie who is a well behaved little cat and Mishmash who is not a well behaved cat. Ruthie is Mrs Sensible’s cat, it plays and meows. Mishmash is supposed to be my cat, but I have disowned her after she wandered into the kitchen and took a dump in the corner. Would you like a nice little kitty? Hmmm… I might… if you can put a cork in it. Pecora Nera goes in search of a cork, while the cat runs of in search of a hiding place. I feel your pain boh! We’ve resorted to a Wind Wifi mobile internet key for the last three months as I’d started to get embarrassed about sitting in our local bar and worked out it would be cheaper to get this instead of spending hours at the bar drinking coffee and Prosecco! Hi Lisa, the signal strength is very bad here, on a scale of 0 – 10. Tim is zero, Tre is zero, wind is zero – 4.5 Vodaphone is 2 – 5. Two tin cans and a piece of string is better than Tim and Tre and Wind put together. I think I will need a satellite dish mounting on the roof . We phone Telecom Italia every week and they say they are waiting for a report from “the engineer”. Oh that’s not good! Fingers crossed that they find the engineer soon! you still don’t have this resolved? The cafe / bar will start charing rent!! Goodness, you wonder how the country functions. There is no life these days without telecommunications. How about inviting the engineer over for an apero? Hi Sarah, you have hit the nail on the head. The country does not function. Don’t be a party pooper, pack a case, bring 4kg of bacon, 4 months worth of T bags and your sense of humour. You will survive. You used my favourite Italian word. Not Telecom, not Italia, but UFFA!!! I love it. The first time I say it, it was in this sentence “Uffa, zio. Hai parlare di calcio tutto il tempo?” Mrs Sensible will be able to translate for you, I’m sure. Good luck with the technology; how long is it now?? I think we’re going to go with these lot – http://www.hyperline.it/ – it’s a satellite on the roof job. So long as you are in the sight line of a radio mast it is supposed to work ok. In the meantime we got a quote from Telecom Italia to take down our phone line, as it is kind of falling off anyway. They want 880 euros to cut down two wires! You can buy a lot of grappa with 880 euros. I will bring my stepladders Mrs Sensible and a pair of pliers. We can hold the ladders while she climbs up and cuts the wire. Predictably enough we already discussed that option (not exactly that, obviously, I was planning on sending Allegra up instead of Mrs Sensible), but apparently if we do all our neighbours will be without phone lines. You never know though, they might actually thank us! Great minds think alike. 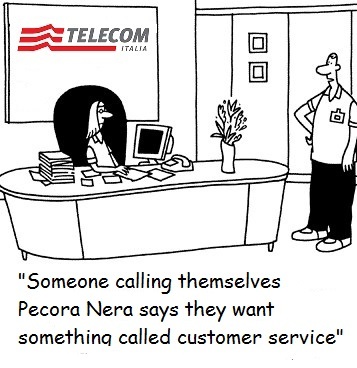 If you cut the phone lines, it will take Telecom Italia at least 4 months to send an engineer. I didn’t really want to put a dish on the roof because this isn’t our house and we will be moving in 2 years, plus Telecom Italia have a line into our house and there is no saying the satellite man will be any better. Italy is a strange country where customer service doesn’t really exist. Another quick example is the guy who is still fixing our boiler, he doesn’t replace parts, he just hits it with a hammer and walks away.. This is the Italian way of solving the problem 😉 When I explain to Italian friends that Telecom Italia have taken months to achieve nothing, they shrug their shoulders and say they are not surprised. The level of responsability, attention and reasoning put in everything, here in the UK, by companies, public institutions and -especially- normal individuals, is something sicilians can’t even imagine. I find it hard to define myself as a sicilian anymore, as I don’t feel so. While they love complaining about things, it’s very hard to find someone willing to do something to change them, as it would be perceived as useless by anyone else. It’s the despair and the sense of helplessness you can get used to so easily that makes Sicily a terrible place to live in. And yes, I do apprecipate Sicilian and Italian cuisine, but there are things that are NOT open to any compromise. Thank you for your comment. There are many people, in fact thousands of people who dream of living in Italy, many have ” occhiali rosa” and have no concept of how difficult life in Italy can be. They are also not aware of the massive exodus of Italians to other countries in search of work or even to live in a country that has less corruption. I still have my rose tinted glasses on and love the country, but then English people are often eccentric. I have always been known to be eccentric….so I’m keeping those “occhiali rosa” (who said you don’t speak Italian?) and keeping my dream alive….someday. At least since I’m retired I don’t have to look for a job there. But….internet connection is mandatory! Mrs Sensible helped with the translation for rose tinted glasses. I have heard some houses in Italy do have internet. Every apartment I have rented in Venice has had really good, really fast internet. Guess being in the city makes a big difference….no poles, no inspection.